Baronie’s BoTels on Lake LBJ offers convenient boat storage solutions, along with general storage opportunities. We keep you close to your favorite boating spots, with secure, accessible storage designed to meet your needs. Call us today to reserve your spot near beautiful Lake Lyndon B. Johnson! 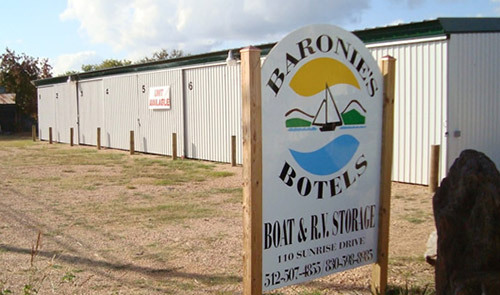 Baronie’s BoTels on Lake LBJ offers convenient boat storage in Sunrise Beach, TX. We’ve been the premier boat storage solution since 1994. With locations near North Lake Travis, South Lake Travis and Lake Lyndon B. Johnson, we are sure to keep you close to your favorite spots. Our LBJ location offers 24-hour access, tall doors for boats with towers and electricity for battery charging. Close to boat ramps and the lovely park on Lake LBJ, our facility is the ideal spot for boaters. When you’re not on the water, we offer the perfect place to rest your vessel. Do you need more than boat storage in Sunrise Beach, TX? Baronie’s BoTels on Lake LBJ also offers storage units in Sunrise Beach, TX. Whether you need to store boating supplies, water toys, or anything else that is crowding your space at home, we have the perfect solution. Our storage units allow you to keep your items conveniently stored until you need them again. We offer standard storage units, as well as boat storage in Sunrise Beach, TX. Between road trips and camping adventures, park your boat at our convenient LBJ location until you’re ready to hit the highway again. Contact us today to store everything from boats to boxes and beyond. We are locally-owned and -operated, established in 1994. We proudly welcome local and regional customers at our facilities. We offer convenient storage for boats and personal belongings, among other items. Our boat storage includes tall doors and electricity for battery charging, for your convenience. Our customers enjoy 24-hour access to their storage location. We are conveniently located near boat ramps and the Lake LBJ park. Spend more time on the water and less time on transport. Enjoy convenient storage and easy access with Baronie’s BoTels on Lake LBJ.